Dozens of motorcycle riders parked their motorcycles in front of Northwest D.C.'s National Cathedral for the annual Blessing of the Bikes. WASHINGTON — Prayers, the ringing of a bell and the roar of motorcycle engines were all heard Friday evening outside Washington National Cathedral in Northwest D.C. Dozens of motorcycle riders parked their motorcycles in a courtyard in front of the cathedral for the annual Blessing of the Bikes. The riders are visiting from such places as New Jersey, Florida, South Carolina and Canada to take part in this weekend’s 30th anniversary of the Rolling Thunder demonstration. 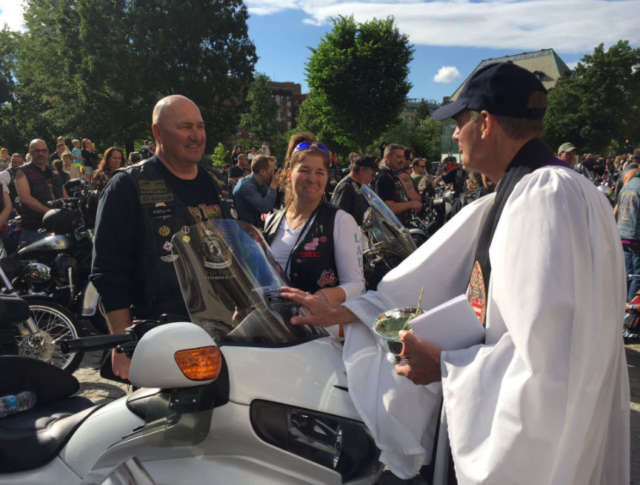 Members of the clergy blessed the riders and bikes with holy water and prayers that God will keep them safe. The event included a two-bell ceremony to honor those who have died while in service to the country, those still missing in action and those on active duty. Sunday morning, Washington National Cathedral will host a national service commemorating Memorial Day.